When PETA launched its "Holocaust on Your Plate" campaign in 2003, the animal-rights organization quickly went from kosher to controversial. The exhibition featured eight 60-sq.-ft. panels juxtaposing scenes from Nazi death camps with images of factory farms and slaughterhouses. 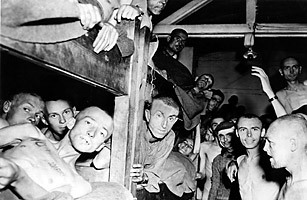 (For example: a photo of concentration-camp inmates crammed into bunkers displayed alongside a snapshot of chickens stuffed into wired cages.) The disturbing comparisons were apparently inspired by Yiddish author and Nobel Laureate Isaac Bashevis Singer, who once wrote of animals: "In relation to them, all people are Nazis." Singer's grandson was even recruited to help promote the campaign. But rallying behind a Jewish vegetarian didn't deter virulent criticism. Groups like the Anti-Defamation League, which fights anti-Semitism, were horrified that the murder of some 6 million Jews in World War II was trivialized, and Germany's high court banned the exhibition altogether. It took Newkirk almost two years to release an apology for the stunt.